Soak noodles in warm water for 2-4 hours. Take shrimp heads and crush in about a half a cup of warm water, strain to get the juices. Boil all remaining seafood in a pot of water (just enough to cover the seafood). Once cooked, strain liquid and put aside. Sautee garlic, onion in oil. Add 2-3 cups of water (include “seafood water” in the measurement). Add Shrimp juice. In a separate pot, “toast” the flour until it is slightly browned, add ingredients from step #3, stir well to avoid lumps. Add ½ to 1 cup of water, trying not to make the sauce too thin. Add Annatto powder, salt, pepper to sauce. Drain soaked noodles, cook in boiling water for about 4-5 minutes. Drain again. 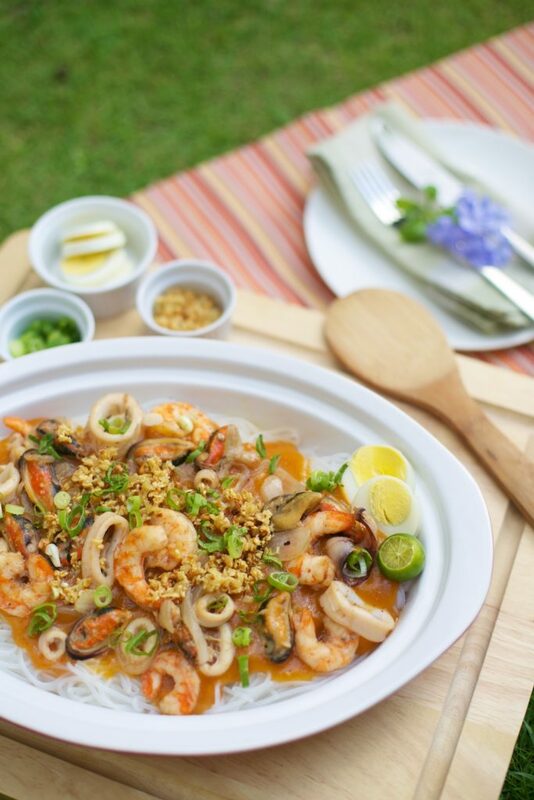 Combine sauce and noodles, arrange seafood on top and add garnish. Serve with Calamansi.